The sport of Trampoline and Tumbling (T&T) is for every child who loves to run, jump and have fun. Physical benefits include speed, strength, balance and spatial awareness. But the real value is in the mental benefits such as confidence, discipline and attention to detail. T&T has been around for many years and made its first debut as an Olympic sport at the 2000 Olympic Games in Sydney, Australia. It is our goal in Tramp and Tumble to have daily challenges that provide kids with daily success. 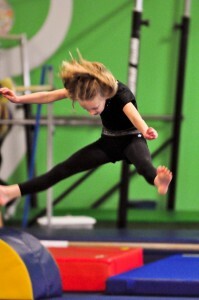 The events included in every class are Tumbling, Trampoline, Mini Tramp and Tumble Trak. Unlike gymnastics Tramp and Tumble is open to a wide variety of body styles and abilities. T&T is ready for anyone that is looking to sharpen their spatial awareness, speed, and/or balance in a fun, safe and exciting environment.